You can see Bus Route Map in operation, Bus Stop- Arrival and Departure, Bus Location in operation. You can see the detailed information like time table and map if you click the bus stop on the Bus route map. 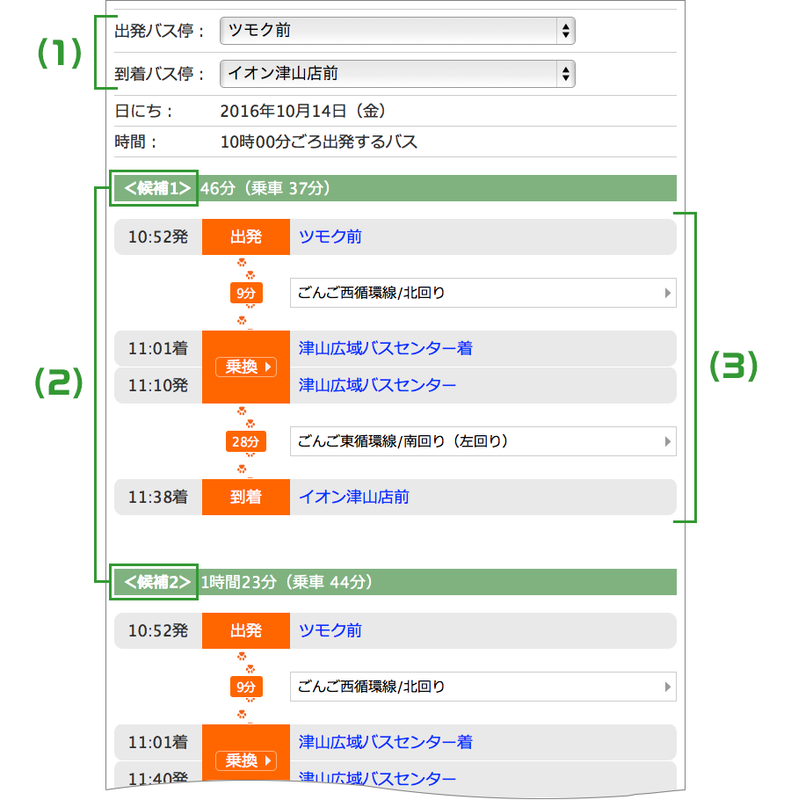 If you input keyword-place you want to go, you could see the further information like the nearest bus stop information, time schedule, bus stop location on GOOGLE MAP, the pictures of surrounding facilities, comments and etc. We will show you the recommended transfer information. If you input the departure and arrival information, you could find out the transfer information and departure time of the bus. Please check out this page, if you want to make sure the location of the bus in operation you usually get on, or if you want to find out Bus route map! First, please choose the area of the bus route (departure and arrival). You can see how to choose in two ways below. Click the area on the map directly, you can choose the area. If you can’t find out the area location, please click the area name or route name from the area list, placed bottom of the page. Confirmed route name and destination area, please click the route information list, you could see the route map page. On this page, you can see the information below. Note: For now, the provided bus location information service is only the east circulation route. 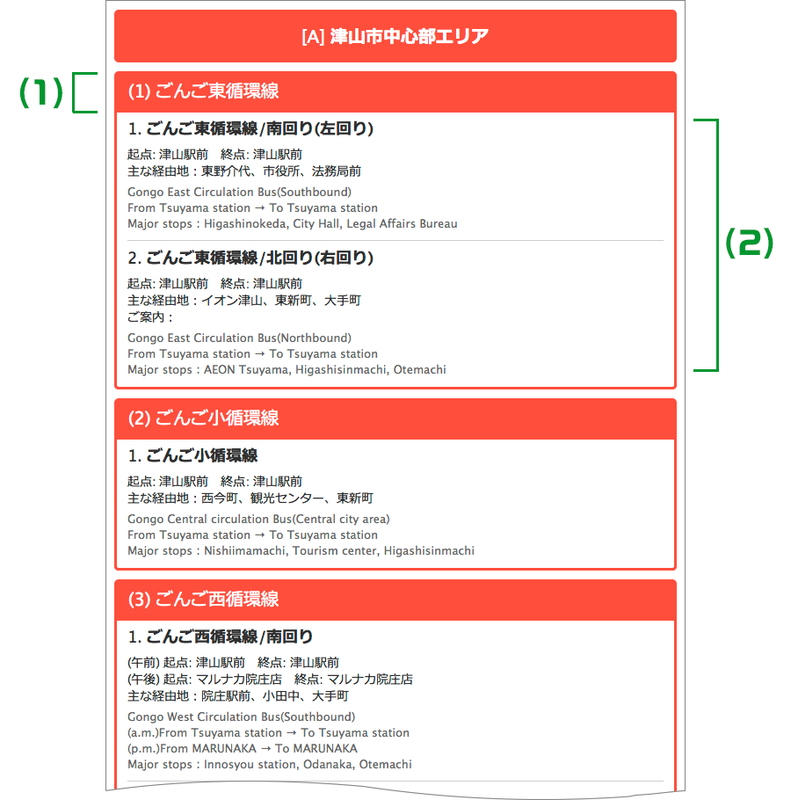 Note: The message; “只今データ取得中です　しばらくお待ちください” will be displayed in the middle of the maintenance or in case of a network failure. You can see the time schedule of the each bus stop, map, picture and so on. Make you feel easy when you use the bus you haven’t got on yet! 1. Input of a free word, finding out the bus station you are looking for. The method to search the bus station selecting the surrounding facility. If the appropriate bus station was found out, you could see the bus station name and route name as a search result. If you would like to know the further information, click the bus station name, then you could see the bus station information name. Simple operation, easy to use! You can check the transfer pattern, estimated departure and arrival time, bus station info, and route info. Also you can easily access to the bus station information page. Note: For now, “Gongo” bus route is available. (1) Input the departure and arrival. Word you will input is the bus station name or the part of the bus station name, both Kanji and Hiragana is OK or any other free word. (2) Select the date you are looking for. You can choose 10 days from today. 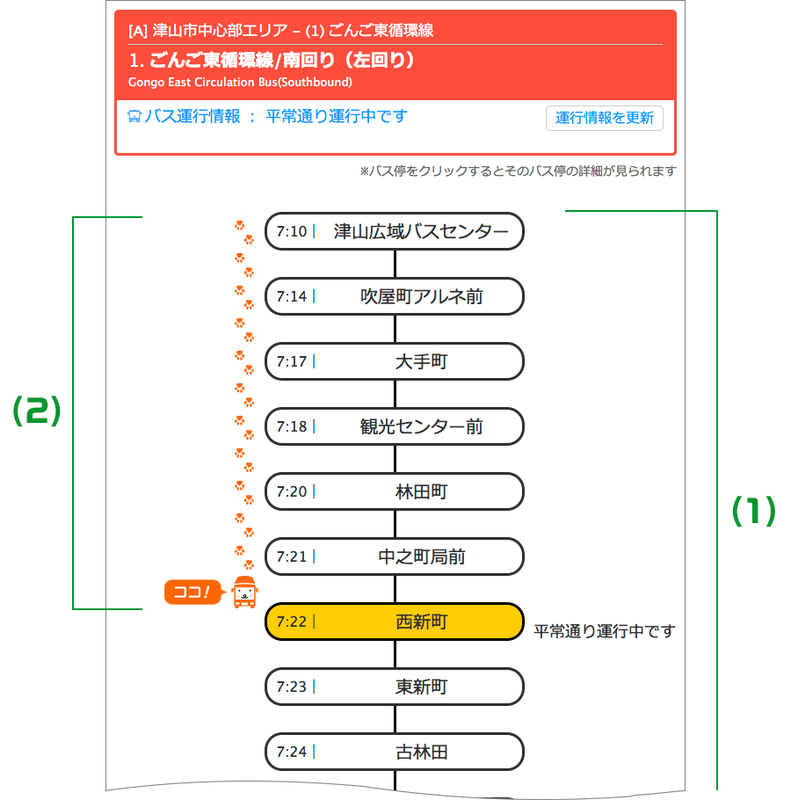 (4) Select the departure bus(出発するバス) or arrival bus(到着するバス). (1) The bus station will be displayed you searched by means of departure and arrival input. You can see the transfer information. (2) In case there are some patterns of transfer choice as a result, the choice will be displayed in ascending order of the estimated required time. (3) Departure and arrival time(estimated time), bus stop information for transfer, route name, required time to the destination, will be displayed. In case, there are some similar names of the bus station as a search result. (1) In case, there are some appropriate bus station, information sentence ” there are some proposal” will be displayed. 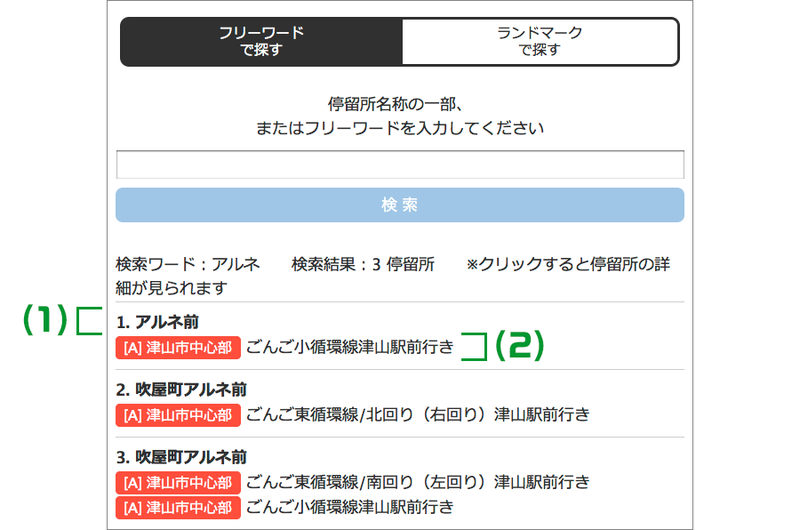 (2) If you chose the wrong bus station, select the right bus station, and click “research”. (3) The departure and arrival bus station displayed in entry field will be searched and the result will be displayed. In case, there is no search result. 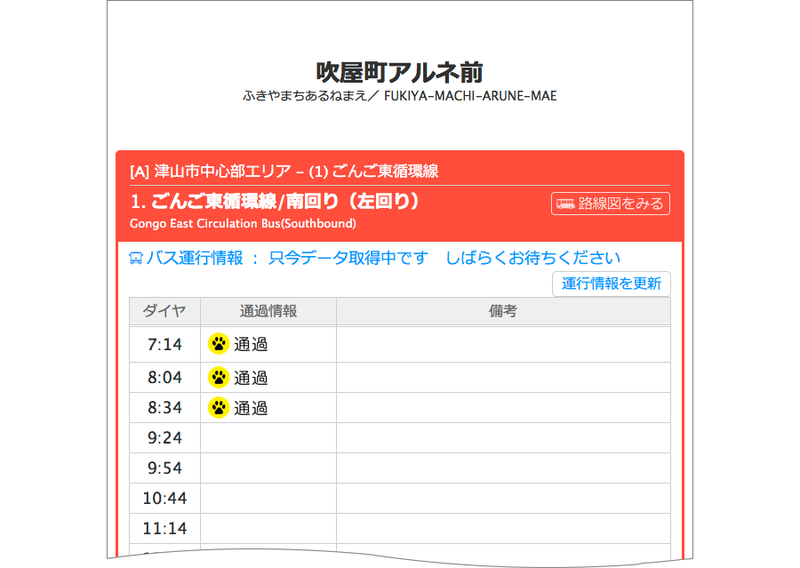 “該当するダイヤまたは乗換情報がありません (There is no appropriate time schedule or there is no transfer information)” will be displayed, in case the system can’t find any bus station based on the word you input on the entry field. If you want to research again, please click the “transfer information” at the menu, and change the free word, date, and time you will input and try again. Note: Regarding to the bus, which is connect into the other route directly without any crossing over or transfer, "乗入" will be displayed. 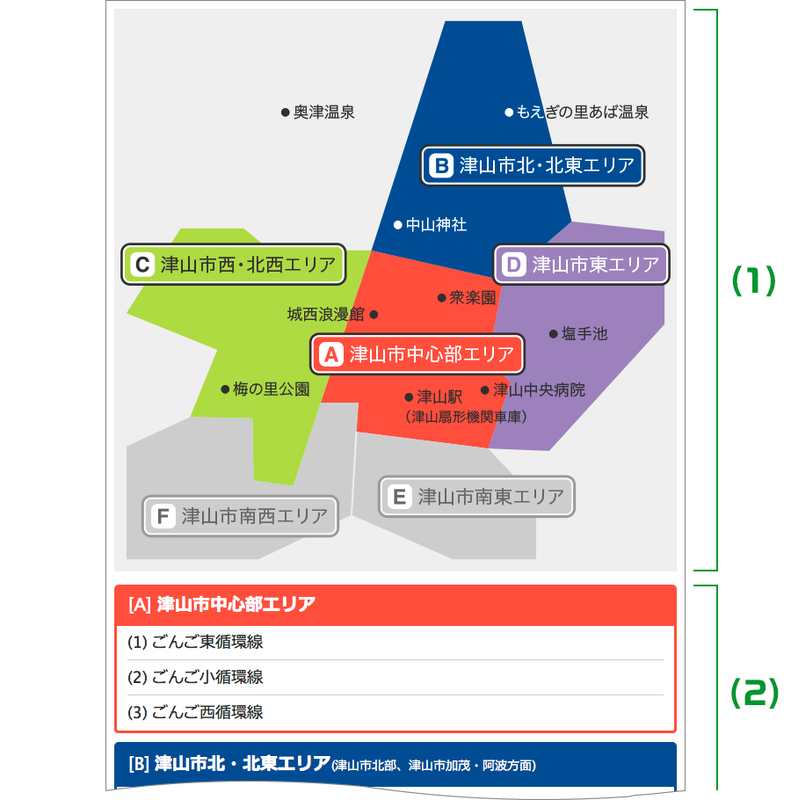 Site Policy（Japanese）｜Copyright © TSUYAMA City. All Rights Reserved.